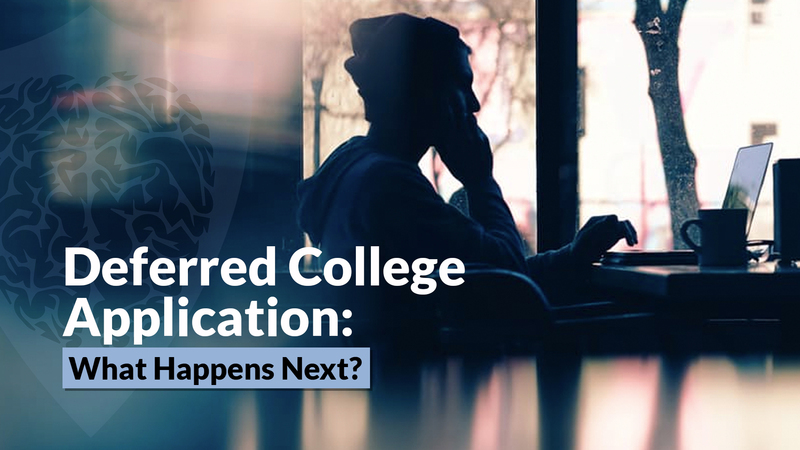 Deferred From College: What Happens Next? So, you’ve applied early and have just been deferred from college? Don’t despair; the sky is not falling. Rather, there are steps you can take towards improving your chances. So, in the meantime, follow this template to Regular Decision redemption! 1. Focus on the good news first. Upon reading your application, the admissions office made a decision that you were clearly competitive enough to make the cut. They almost certainly do not harbor any doubts about your ability to succeed academically as a student. Nonetheless, being deferred from college means that they want to take a look at your application in the context of the remainder of the pool of Regular Decision (RD) applicants. Admissions offices at selective colleges are tasked with extremely difficult choices, and you shouldn’t be too hard on yourself if you are deferred from college. When I applied to college, I was deferred from my top choice school and ultimately didn’t get in until the RD cycle. I firmly believe that steps I took in between receiving the disappointing news and the great news were crucial in pushing me over the top. If you are deferred from college, you may be asked to submit additional information, opt-in to future consideration in the RD pool, or given deadlines or protocols for mid-year grades and additional test scores. In keeping with this advice, you should do research (from reliable sources) on how your target school prefers to receive updates like the ones you’ll be wanting to send down the road. For instance, for waitlisted students (different from deferrals, of course) at Harvard, Former Admissions Officers have told us that Harvard would like an update every month or so after the waitlist notification. This sort of action conveys that Harvard still remains your top choice. 3. Recalibrate your college list. If you are a student who has procrastinated about adding anything less than “reach” schools (statistically speaking, based on median accepted figures from the previous year) to your school list, this will be most important for you. It’s time to get more conservative because you don’t get another shot at this process. Getting deferred from college isn't the worst scenario, but make sure you are realistic about giving yourself options. For those of you who planned for all contingencies beforehand, you won’t really have anything to do here unless you simply want to add more fit or safety schools to your list. 4. Begin drafting a Letter of Continued Interest (“deferral letter”) with the aim to submit it in early-to-mid January. This is an opportunity for you to basically write yourself a letter of recommendation about your most recent accomplishments to shed light on updated scores, an upward trajectory in grades, or meaningful evidence of your extracurricular or community impact. You should generally not exceed one page for such a letter and should focus on new information. If you cannot think of any new information whatsoever, you need to start thinking about new ways to frame old information in an updated light even if it’s not particularly novel. Of course, you need to be genuine and honest. However, for those of you following this advice, you should be thinking about what kind of novel accomplishments you might have (with an eye toward things you might write about in one of these letters) from the moment you received notification that you were deferred from college. Have you received any awards from your school? Dean’s list? Academic Honors? Sports team captaincy? New position in a club? What kind of tangible or measurable results have the school and extracurricular in which you participate achieved? Did your soccer team win the district finals? Did your school play set records for attendance? Did you create a new way to raise money for Habitat for Humanity? Did you start more advanced research building on some of your interesting coursework with your teacher or with an academic mentor outside of school? Have your grades been steadily improving? Was there a particular subject you were having trouble with that you’re doing well in now? Do you have new SAT or ACT scores to report? Did you submit some kind of interview, which you hadn’t already submitted? Has your interest in a particular subject evolved? Tell the admissions committee how it did through the lens of something new you’ve read or tried, or someone new you’ve interacted with. If you were in contact with anyone from the school in question--perhaps a coach, professor, or someone relevant to an activity you participate in--you should be in touch with them and write about that contact in your deferral letter. Remember, you don’t want to be talking to them about “your chances” or anything admissions-related after being deferred from college. Rather, you should have genuine conversations about your interests and how you’re working to develop them, and you should solicit sound advice about how to go about doing that. Your letter should maintain a polite, appreciative, and interested tone. You should not come off as disappointed or entitled. You should not wax poetic about how much you love the school and how they’d be making your dream come true. This is not a “love letter” (unless you happen to write love letters in a very straightforward and logical way with supporting evidence and detail). You want to be concise, and should even consider using bullet points or numbers in the middle of the ~one-page letter to draw attention to your 2-3 updates. In that sense, those updates shouldn’t be too dissimilar to an entry in your Common App Activities & Experiences List. Do not forget to articulate that the school remains your top choice (if that is indeed the case). This is especially important for binding ED schools because you will have been released from your binding obligation once you are deferred from college. The school will now care about the fact that you may or may not accept its offer. So, don’t leave any room for doubt! 5. Consider asking another recommender to send a letter on your behalf. You need to be sure the school allows this before doing so. You don’t want to risk sending unsolicited materials that will annoy the admissions officers because of your inability to follow directions or posted guidance. However, this could be an opportunity to share a different perspective about you with the admissions office. Perhaps if you sent only teacher letters of recommendation, you might send one from a coach or colleague. Think about the biggest gap in your submitted materials. What aspect of you did the admissions committee not get to know very well? What attributes could you have given better evidence of? Then, think about how a third party (recommender) could help you fill that knowledge gap for the admissions committee and add the missing piece to the puzzle. For example, a common mistake we see is that students ignore any showcase of their personal qualities (and instead solely focus on intellectual qualities). For example, if you look at Stanford's supplemental essays or Princeton's, this could be the kiss of death for your application. One good clue as to how much emphasis is placed on personal qualities is to see if any of the supplemental questions are “letter to your future roommates” or “what matters to you personally”-styled questions. If you are deferred from college, go back and reassess the school's application. What are they looking for? How can you show that you fit the bill? 6. Stay engaged to demonstrate interest in the school. If you had an alumni interview, check in and let him/her know you were deferred from college. This can be especially important if you had a good rapport with the interviewer. Interviewers might have useful suggestions for compelling features of your candidacy or accomplishments you might focus on in your letter of continued interest. If you had contact with an admissions officer who visited your school, keep in touch via e-mail with the occasional intelligent question in a well-crafted e-mail (unless explicitly instructed not to). If there’s a professor whose research you are interested in or who you knew from a summer program, strike up a conversation. Remember, you don’t want to be talking about admissions with these people. If you do, you’ll only be hurting yourself (unless they specifically ask you something). 7. Don’t let “Senioritis” sink in. You need to stay excellent (or right the ship and become excellent!) throughout your second semester so that you give yourself the best possible chance of admission. There is no reason for you to not finish off high school as strongly as possible. This doesn’t mean there is absolutely no time for rest and relaxation, but you need to stay motivated and focused on your ultimate goal. Give yourself the best chance at climbing out of the deferral pool and into the pile of acceptances!